Just about a week ago the writer talked to Grandfather Carl Lueck when he was in Corcordia—this (Thursday) afternoon his remains were laid to rest in the Lutheran cemetery at Ernestville. Grandfather Lueck, apparenly [sic] well, was sitting out of doors Tuesday morning, August 25, 1931, when the summons came for his departure to meet those gone before. He died at an age of 92 years, 11 months and 22 days—a ripe old age. His was a beautiful and long life, nicely taken care of by children whom he tried to assist in many ways. The funeral was held today (Thursday) from the country home of Mr. and Mrs. Charles Lueck, southwest of Concordia where the departed made his home. Rev. Viets preached the funeral sermon, spoke words of comfort and cheer. The choir and congregation sang songs of faith and hope, and many were those who took a last look at the venerable features of the departed. The body was laid to rest in the Lutheran St. Matthew cemetery in the firm hope and belief that it shall rise again on resurrection day by the command of the Prince of Life. 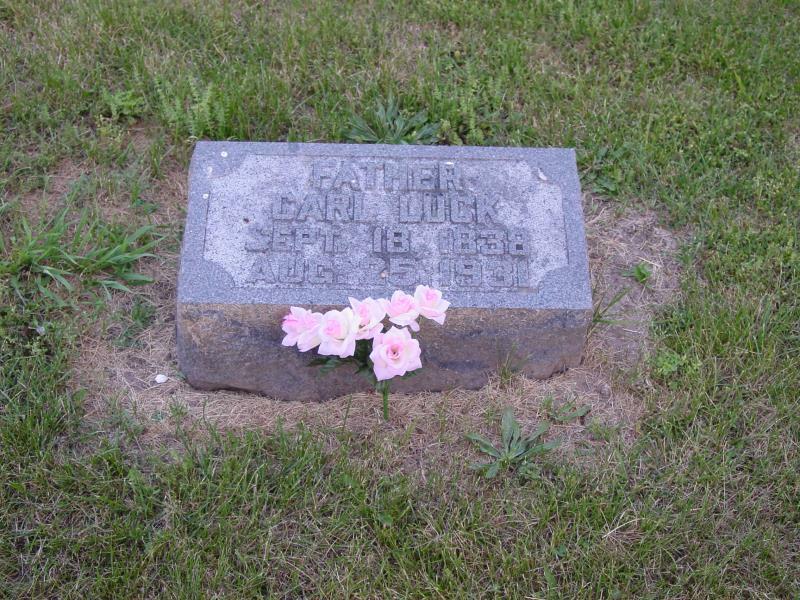 Carl Lueck, son of Carl Lueck and his wife Caroline, was born September 18, 1838, at Cossien, Pommerania, Germany. There he was baptised and confirmed. In 1862 he married Miss Minna Wendt of Pitzerwitz by Pyritz, Pommerania, who died March 4, 1915. This union was blessed with six children, two of whom preceded their parents in death, Mrs. Frank Marth and Emilie Lueck; those who survive are: August Lueck of Lexington; Herman Lueck, Berlinchen, Neumark, Germany; Charles Lueck of near Concordia, Mo., and Arthur Lueck of Oak Grove, Mo. ; twenty-four grandchildren, twenty-nine great-grandchildren and many relatives and friends. The family came to the United States in 1892 and first went to Aullville and made their home with Frank Marth’s, one and one-half miles east of that town, later they moved to Concordia. Grandfather Lueck was a kind and loving husband and father, a true friend, neighbor and Christian, who was a friendly and kindly man. The mourners have our sympathy in their bereavement. Carl (Karl) Lueck was my g-g-g-grandfather.